Moreover, contrary to what most of the trade unions and some sectors of the "gauche", the more or less "radical" left are saying, but also the quasi-fascist "populism" represented by Le Pen , which would like to put itself at the head of the gilets jaunes, the places in which the movement started and developed are not those where the Rassemblement National has found most electoral support, nor indeed does it appear that the popularity of our interior minister’s close ally  has grown in recent polls. In short, it would seem that, until now, the movement is not at all dominated by the "populist" or nationalist right, but instead shows a healthy mistrust towards all the more or less institutional political formations, whose political representatives are thus obliged to keep their distance. Of course, given its shapeless, open nature, it goes without saying, that the interclass character of the movement, means anyone can try to slip inside it with a certain ease and the extreme right groups don’t hang back. Thus, according to some journalistic reports, the attempt to burn the prefecture of a small town was precisely down to the action of some neo-fascist militants. Just as it is not surprising to record racist and xenophobic voices on the pickets in the streets, or the massive presence of the tricolour, often accompanied by the Marseillaise, but from here to indiscriminately reduce the "people" who participate in the movement as irretrievably right wing, "populist" or based on "identity” is far off the mark. Indeed, if you tease out the claims that the gilets jaunes have sent to the press and to parliament , there are several "points" that reject the actual policies of the "populists" when they were, or are, in government , and were compelled by force to take back the empty promises they made in the election campaign. Fishing among the "points", one can find calls for a progressive income tax , pensions at sixty and fifty-five for those who do strenuous jobs , and a pension minimum of one thousand two hundred euros a month indexed to the cost of living. Just as an aside, this is the opposite of the measure passed by the Salvini-Di Maio duo in Italy, which rejects the indexation of pensions above 1520 euros gross per month. Getting back to the “points”, there is a demand for an increase in the minimum wage and wages in general, indexed to inflation, payment of a "French" salary (with related "rights") to those who work in France with contracts stipulated abroad . And again, regulation of precarious jobs, the reorganisation of energy services with the relative lowering of energy prices, the cancellation of cuts in social services and the extension of the latter with enhanced care services for the elderly, the disabled, and children, plus housing benefit, and help for students, etc are all demanded. There are also demands for protection of the environment, against climate change  and, "even", for asylum seekers to be treated well, with French language courses for immigrants , along with courses in the history of France, to accelerate integration: a step that could, of course, open the way to nationalism. It is true that these are all also typical demands of the petty bourgeoisie ruined by big, clearly reactionary, capital, in the sense that capital's mode of existence has never been stopped by legislation to protect small and very small businesses nor will it ever be , but this is normal in a movement of "people", which is naturally socially diverse. Another body is needed, This is an instrument that unifies the class ferment, enabling it to make a qualitative, that is a political, leap, to give it a strategy, and anti-capitalistic tactics, to direct the energies emanating from the class conflict towards an assault on the bourgeois system; there is no other way forward. In short, the active presence of the communist, international and internationalist party is necessary. Otherwise, the rage of the proletariat and the declassed petit bourgeoisie will be crushed and dispersed; either brutally, if needed, or with false promises. 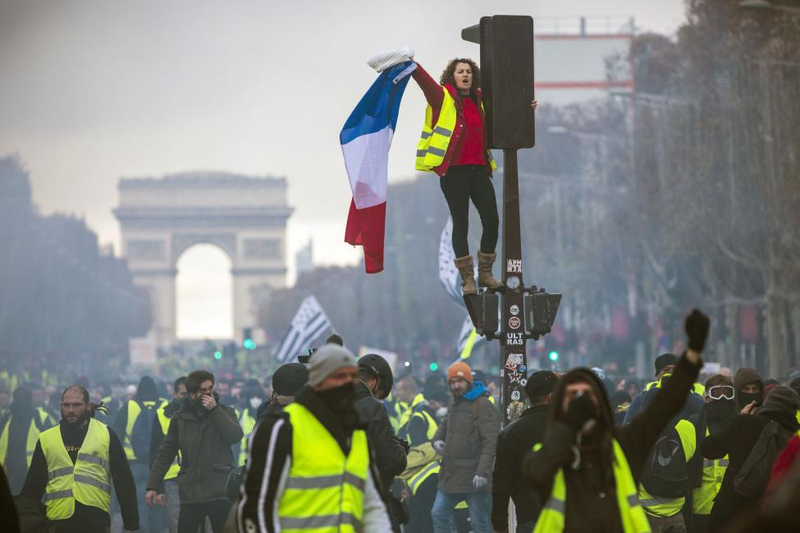 The illusion of any government in which the gilets jaunes are represented will just be a blind alley where proletarian hopes will be ended. Only the conscious activity of the revolutionary proletariat can answer the question, in itself simple, but outside the scope of reformism, posed by one participant in the roadside pickets: «If [Macron] goes, who will take his place?» . Marine Le Pen is the chief executive, the head, of the Rassemblement National, the name taken by the Front National since 2018. The reference is to Matteo Salvini, head of the Lega in Italy and ally of Le Pen. The Lega is in coalition with the other “populist” party, the Five Star Movement under Di Maio. What this certainly indicates is inexperience, great ingenuity and political immaturity, elements that are inevitable, given the characteristics of the movement itself and of the historical phase in which we live. The list, in French, is reported in the article by Robert Dugot, France-debat. Les «cahiers de doléances» of «gilets jaunes», in www.alencontre.org. An Italian translation exists on the Sinistrainrete website. The cahiers de doléances were documents that collected the complaints expressed by every social stratum prepared for the Estates General, which opened on May 5, 1789, the first act of the Great Revolution. In addition, we take it for granted, with the program of any government, not just those "sovereign". In the face of the flat tax by Trump and Salvini, as well as the fiscal policies implemented by the governments for a few decades now, aimed at lightening, even in a consistent way, taxation on capital and large assets. Masons and butchers are mentioned as an example. It is a claim against the decline in wages, even drastic, to which sectors of immigrant workers are subjected and, consequently, also the indigenous labour force. To give a concrete example, in the shipyards of Monfalcone, some time ago there was the practice of paying workers from Eastern Europe or the Far East with salaries similar to those paid in their countries of origin, naturally much lower than those of Italy. We do not know if this infamous practice has been eliminated, but, we are instinctively skeptical about it. Contrary to those who, in the early days of the protest, said that the yellow vests were "kidding" on the environment. Among these, there is the aid to small-scale trade and the cessation of the opening of large hypermarkets, the protection of French industry, with the prohibition or the brake on relocation, the lowering of taxes on the small business, in addition to fuel, which affects hauliers and farmers. Despite the clashes with the police, there is also no demand to increase resources for the police, the administration of justice and the army. From the Le monde diplomatique dossier of January 2019.